Julia Elizabeth Wellswas born on this day in Walton-on-Thames, Surrey, England in 1935. She is 77 years old. In the movie version of The Sound of Music she sings “Perhaps I had a wicked childhood / Perhaps I had a miserable youth / But somewhere in my wicked, miserable past / There must have been a moment of truth…” While those lyrics were written for her character, Maria, they echo a past that Andrew’s called “a very black period in my life.” Her stepfather was an alcoholic (so was her mother to a lesser degree.) Julie had to put a lock on her bedroom door after Pop tried, drunkenly, to get into bed with her, twice. During World War II she lived through the Blitz. She performed for King George VI’s family during the 1948 Royal Command Variety Performance in London. (She is the youngest performer ever to do so.) The Andrews act went on radio and TV. She was a cast member on the radio show Educating Archie from 1950-1952. At 19 she made her Broadway debut as Polly Browne in The Boyfriend. Next she auditioned for the new musical adaptation of George Bernard Shaw’s Pygmalion and created the role of Eliza Doolittle in Lerner and Loewe’s My Fair Lady. 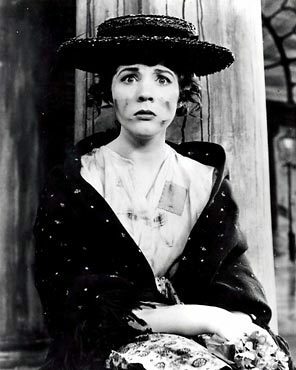 During her Broadway run of My Fair Lady she transformed from rags to riches again in the 1957 Rodgers and Hammerstein television musical version of Cinderella for CBS TV. In 1959 she married set designer Tony Walton. Her next Broadway triumph was in 1960 as Queen Guinevere to Richard Burton’s King Arthur and Robert Goulet’s Lancelot in Lerner and Loewe’s Camelot. She was terrific as both Eliza and Guinevere, but when it came time to make major motion pictures of the musicals the producers opted for actresses with more proven box office success. Jack Warner gave Eliza to Audrey Hepburn. Vanessa Redgrave got Guinevere. Andrews returned to England to have her daughter Emma instead. 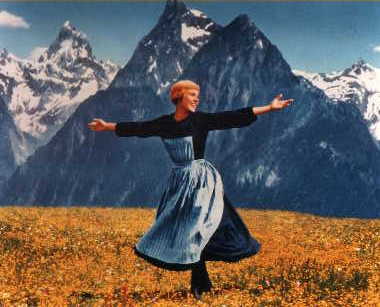 In 1965 Andrews stepped into the role of Maria Von Trapp for the 20th Century Fox movie of The Sound of Music. It went on to become the third highest grossing film ever made. The soundtrack sold more than 11 million copies. United Artists produced Andrews next movie, Hawaii based on the novel by James A Michener. The film earned more than $6 million, and was 1966’s biggest box office hit. Also in 1966, she co-starred with Paul Newman in Cold War psychological thriller Torn Curtain for director Alfred Hitchcock. Andrew’s next movie musical was Thoroughly Modern Millie for Universal Pictures. The 70s were quiet for Andrews. She divorced Warner and married director Blake Edwards. Although she continued to do television work — including a variety show, guest spots and specials — she focused much of her time during the disco decade raising her family. In Edwards’s 1981 film S.O.B. she rather famously shed her innocent image by barring her breast. The next year she played dual roles in Victor Victoria and earned another Golden Globe Award. The Princess Diaries gave her career yet another breath of fresh air as she co-starred as Queen Clarisse Renaldi with Anne Hathaway. She put on the crown again for The Princess Diaries 2: Royal Engagementt in 2004. The same year she donned an animated crown was Queen Lillian for Shrek 2 (and the subsequent Shrek sequels) and she narrated Enchanted. She also voiced the character of Marlena in Despicable Me in 2010. She was given the title Dame Commander of the British Empire by Queen Elizabeth II in 2000 for her work both in the entertainment industry and for her involvement in charitable organizations like Save the Children, the UN’s Fund for Women and the Foundation for Hereditary Disease. This entry was posted on Tuesday, October 2nd, 2012 at 2:25 am	and posted in Broadway, England, Entertainment, Film, Julie Andrews, Music, Musical Theatre, postaday, Thought of the Day, Today's Birthday, World War Two. You can follow any responses to this entry through the RSS 2.0 feed.